A while ago I wrote an article about the Answers in Genesis creation museum, and received a comment from someone calling herself “The Happy Feminist” who asserted that evolutionists do not have an agenda. She claimed that evolutionists are only interested in the truth, but is her claim true? I wish there was such a thing as a “Two Kingdom” evolutionist, but I’ve never run into an evolutionist who believes that we should simply keep evolution in the science theory books. Most want to spread the implications of evolution to every other field, such as the practice of law. I don’t know of any evolutionists who promote the kind of dualistic view of life to their worldview that some Christians seem to encourage for the Christian worldview. The evolutionists most definitely have an agenda for all of life and culture, and it is necessary for Christians to oppose their agenda at every level and promote God’s agenda for life, as revealed in His Word, in furtherance of the Great Commission. I now see one of the bases of misunderstanding between people who believe in Biblical creation versus people who accept the theory of evolution. Creationists, I now see, think that evolutionists have an agenda, an agenda above and beyond the search for truth by means of the scientific method. In response to this claim of objectivity and harmlessness, consider the following quotes by various evolutionary, humanistic leaders on a handful of significant areas of life and culture. As Casler further explains, from the evolutionary viewpoint, marriage and family are out-dated. So do evolutionary humanists have an agenda about marriage and family? Apparently, they do, and their agenda is that they are against it. For evolutionists, it is time for society to evolve away from marriage and the family. 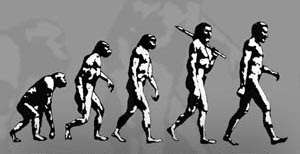 Do evolutionists have an agenda for politics? Apparently, they do, and it entails a one-world government and global disarmament. So do evolutionists have an agenda for morality? Apparently, they do. Namely, moral relativism — allowing for sexual promiscuity and abortion, among other things. The Evolution Agenda for Truth? Pretending that evolutionists do not have an agenda — when they have published so much detailing their agenda on various aspects of life — comes across as absurd. Even more absurd is the contradictory idea that evolutionists are commited to the truth when they have denied any basis for the concept of truth. Why should mankind uphold truth, if there is no God who requires that we uphold truth? 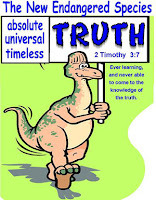 The very concept of truth is a Christian concept, and the evolutionist is forced to borrow from the Christian worldview in order to have any sense of stability in his life. Yet the “Happy Feminist” writes that “the point of the scientific method is to search for truth regardless of where it leads or where we wish it to lead.” Why? Why should an evolutionist adopt the scientific method? Why should an evolutionist search for truth? What is the standard of truth in the evolutionary worldview? As evolutionist Max Hocutt revealed, the standard for truth in an evolutionary worldview is man. Man in the evolutionary, humanist religion, has in effect become god on earth. He holds the position other religions reserve for God. He makes himself, and he sets his own rules. His belief in himself or the scientific method as a standard of truth is a faith-based belief. He has no way to use even the scientific method to prove that the only realities in the world are material. The evolutionist has exchanged one faith for another.